Figure 1: Maṇi on a hill near Tau with a subscribed a-chung. 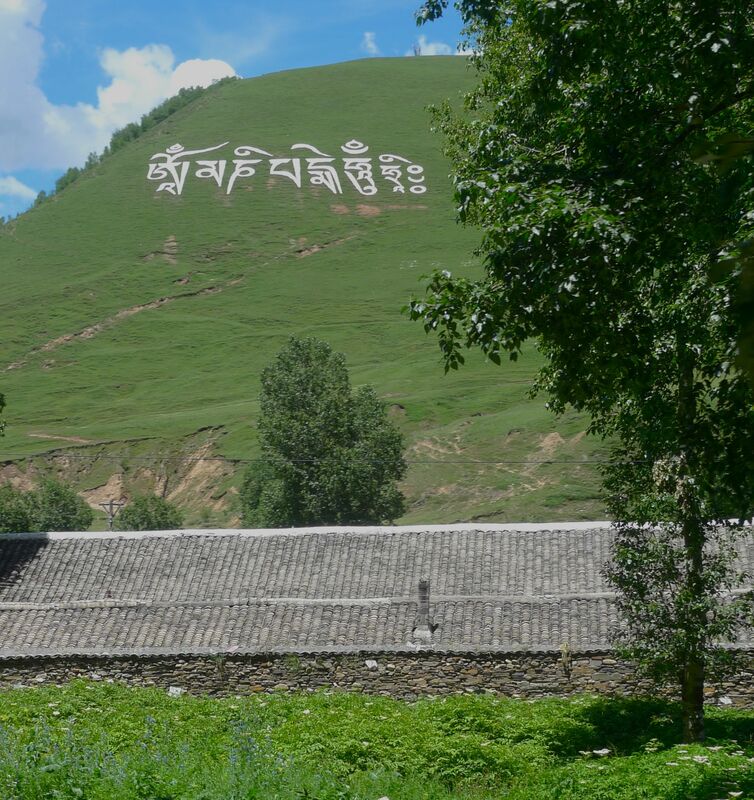 A while ago I wrote a post about the proliferation of giant hillside renditions of oṃ maṇi padme hūṃ, the mantra of Avalokiteśvara, the Bodhisattva of compassion and mythical patron of all things Tibetan. This mantra, known simply as the maṇi, is one of the most pervasive practices of Tibetan Buddhism, being inscribed on stones, rendered across hillsides and recited by millions of Tibetans daily. One early Jesuit missionary, ignorant of Buddhism but struck by the pervasiveness of the maṇi mantra, reported that the Tibetans worshiped the god ‘Manipe’. Despite the pervasive presence of the maṇi in Tibetan religiosity, however, there does not seem to be consensus on how it should be spelled. Figure 2: A pool table converted to a maṇi plaque near Katok Monastery. No a-chung. An observant reader may have noticed that the hillside maṇi pictured in my earlier post has a small a-chung (འ) underneath the oṃ (ཨཱོཾ; see figure 1). Most renditions of the maṇi that you see around Tibet, however, lack this subscribed a-chung (ཨོཾ; see figure 2). This tells us a couple of things. First off, the fact that all of those hillside maṇis I saw last summer uniformly included the same quirky spelling probably means they are all the work of one industrious person or group. Secondly, either that person or group is just plain wrong, or there are multiple traditions floating around for how to spell one of Tibet’s most important cultural touchstones. And that’s kind of neat, and definitely worth looking into. Given that the maṇi is a Sanskrit phrase rendered in Tibetan script, the obvious first stop for someone trying to resolve this riddle is to figure out how the syllable should be written in Sanskrit. While I, unfortunately, don’t read Sanskrit, I do know several people who do, and I’ve spent the last few weeks grilling them about how one should properly write the syllable oṃ in the language of the gods. (the next bit is kind of technical, and I’ve probably got it wrong anyway, so if you’re in a rush feel free to skip to the conclusion) When rendering Sanskrit in Tibetan script, a subscribed a-chung like the ones we see here is used to turn a short vowel into a long vowel. So, for instance, the short ‘a’ (ཨ; अ in Devanagari, the most common Sanskrit srcipt) becomes the long ‘ā’ (ཨཱ; आ) with the addition of a subscribed a-chung. Sanskrit, however, does not have a short ‘o’, so an a-chung is not needed to create the long syllable ‘ō’ (ཨོ; ओ). 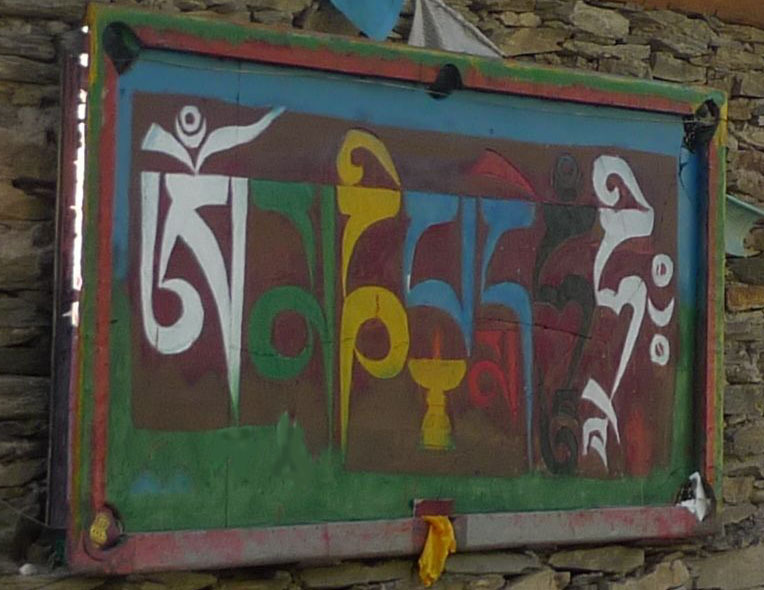 Instead, adding the a-chung to ‘o’ gives us ‘au’ (ཨཱོ; औ). So, without the a-chung, we have the syllable ‘oṃ’ (ཨོཾ; ओं) and with the a-chung we have the syllable ‘auṃ’ (ཨཱོཾ; औं). As for which is the correct spelling, I am told that in general practice the syllable is usually rendered ‘oṃ’. This is the familiar glyph ॐ, and would seem to favor those versions of the maṇi that lack the subscribed a-chung. On the other hand, the Māṇḍūkya Upaniṣad, an early Indian scripture that deals entirely with this sacred syllable, is less straightforward. In its opening line, the syllable is spelled ‘oṃ’, but a few lines later the constituent phonemes are identified as ‘a’, ‘u’ and ‘ṃ’. Finally, Wikipedia, that great arbiter of all knowledge, spells it ‘auṃ’. So, even in the Sanskrit, we have multiple ways of spelling the syllable oṃ. Or is it auṃ? Figure 3. Three maṇis in an old manuscript of the Maṇi Kabum. No a-chungs. Another way to look at this would be to consider historical and contemporary instances of the maṇi and see what percentage of them have an a-chung. Here, the balance clearly seems to tip in favor of oṃs without a-chungs. Sitting around on my computer, I have two scans of a Tibetan text known as the Maṇi Kabum. As its name implies, this text is one of the most important Tibetan works on the maṇi ever composed (its title can be loosely translated as Collected Works on the Maṇi), so it seems like a good place to look. No a-chungs in either copy (See figure 3). Additionally, a few months ago I remember seeing a 13th century funerary slab from Mongolia with the maṇi on it with no a-chung. So this spelling is attested at least that far back. Further, the images produced by searching google for ‘maṇi stone’ almost invariably lack a subscribed a-chung, which goes someway towards showing how widespread this spelling is. The epigraphical record, however, does not entirely favor the no a-chung camp. Browsing the Tibeto-Logic blog a while back, I came across these images of the syllable oṃ from texts preserved in the Dunhuang caves (see figure 4). These ancient doodles, at least a thousand years old, have large, clear, unmistakable subscribed a-chungs. Whatever happened later, at least we know that oṃ could be written with a subscribed a-chung a long time ago. Figure 4. Oṃs from Dunhuang, with subscribed a-chungs. We started out with a quandary: should the first syllable in the ever-present mantra oṃ maṇi padme hūm have an a-chung? We looked at the Sanskrit, and concluded that in general use the Sanskrit does not require an a-chung, but that there were notable instances indicating it should be there. Then we checked the epigraphical evidence, which overwhelmingly favored the anti a-chung element, except for that pesky Dunhuang scribble, which just happens to be the oldest version of the syllable I’ve seen. (No, I haven’t combed through the rest of the Dunhuang documents. Anyone interested in doing so can look through most of them at the International Dunhuang Project. Let me know what you find.) If it seems like we’re no closer to an answer than we were at the beginning, that’s probably correct. But, at least now we have some idea why we don’t know anything. Thanks to Karen Lang, Kurtis Schaeffer, Dominic DiZinno, Ben McClintic and Eva Natanya for their sanskritic insights. Lopez, Donald S. Prisoners of Shangri-La: Tibetan Buddhism and the West. Chicago: University Of Chicago Press, 1999. p 117. If you read latin and prefer the original, check out pages 72 and 73 of Kircher, Athanasius. China Monumentis: Qua Sacris Quà Profanis Nec Non Variis Naturae [et] Artis Spectaculis Aliarumque Rerum Memorabilium Argumentis Illustrata. Meurs: Jacobum, 1667. Olivelle, Patrick. The Early Upaniṣads: Annotated Text and Translation. Oxford: Oxford University Press, 1998. p. 473-477. This was on loan to the UVA Art Museum, but the docent yelled at me for trying to take a picture, so I can’t produce any photographic evidence. Those with access to TBRC can download the Punaka edition of the Maṇi Kabum, reference W19225. A Large mani on a hillside near Tau Prefecture. Click to Enlarge. I’m now two weeks into my first trip to Tibet in three years. Many things are the same, but many are different. Last time I was in this region of Kham, I remember being struck by several huge mani mantras inscribed across entire hillsides, often in strategic locations above villages or near river confluences. In the intervening three years, these mantras have notably increased in both size and frequency. On the road from Dartsedo to Karndzé it seemed like every village had at least one of these epic endeavors. It is hard to escape the idea that the region’s Tibetans are making a strong statement about the identity of their land. Of course, this is not the first time that Tibetans have used the construction of religious monuments to claim or alter the identity of their land. If we are to believe Tibetan historical accounts, the importation of Buddhism was only made possible by the construction of twelve temples by the sixth century king Songtsen Gampo. The construction of these temples suppressed a malevolent demoness who had been obstructing Buddhism. By building the temples, the king suppressed the opposing forces and established Tibet as a Buddhist nation. Nor is such activity limited to the Tibetan Imperium. On a smaller scale, it remains common for local Tibetan communities to deal with malevolent spirits by erecting prayer flags or a small chörten. As with Songtsen Gampo’s temples, these constructions effectively overcome whatever was polluting or obstructing the area, restoring its proper Buddhist identity. Three manis (one obscured by trees) not far from Bamé. Click to Enlarge. It is not surprising, after the events of the last half century, that Tibetans here would feel a need to re-assert the Buddhist (and thereby Tibetan) nature of their land. Nor, I suppose, should it be surprising that the pace of that activity has increased since 2008 (in addition to the new hillside manis, I saw three large chörtens under construction between Dartsedo and Karndzé as well as numerous new prayer flag arrays and smaller chörtens). Nevertheless, these constructions, and the sentiments they represent, seem worth noting for those of us who try to keep our fingers on Tibet’s pulse. As I was leaving Kham, driving from Karndzé to Dartsedo, I noticed a monument I did not see on the way up. It was laid out across a hillside and made out of white stones, just like the large mani mantras discussed above. It was, however, written in Chinese and located directly below a large police station. While I was unable to get a picture, and only had a few seconds to try and read it, I’m pretty confident the first phrase said something along the lines of ‘work hard for a good country’. Apparently, at least some elements in the Chinese government have grasped the importance of marking the landscape in this way, and have decided to get in on the act! Sorry about the poor photos, most were taken from moving vehicles! Germano, David. “Remembering the Dis-membered Body of Tibet” in Goldstein, Melvyn C., and Matthew T. Kapstein, eds. Buddhism in Contemporary Tibet: Religious Revival and Cultural Identity. 1st ed. University of California Press, 1998. Mumford, Stan Royal. Himalayan Dialogue: Tibetan Lamas and Gurung Shamans in Nepal. Madison: University of Wisconsin Press, 1989.